I blew 4 baffle walls on my Ozone Frenzy and thought i would have to buy a new kite. Fixmykite put it back together and saved me a bunch of money. My best Kahoona had a complete panel blowout and you guys put the sail back together. The graphics on my kite was matched up and looks great. I had a kid on a bicycle run over my kite and ripped the sail and a strut. I sent my kite to fixmykite.com and the fixed it up in no time. The thing I really like is that the repairs are guaranteed. I needed help building my custom bar setup from my c kite. 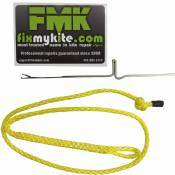 Fixmykite.com was very helpful and got my setup exactly how I wanted. Thanks again guys. I just got my Liquid Force Envy and the third time I took it out I crashed it on the rocks and blow the leading edge and the sail. When I got my kite back from you guys I could barely see the repairs. Thanks for getting me back on the water. I crashed my kite in a tree and had several little cuts in the sail. I thought I could just use duct tape, but that didn't last long. The next time I rode I crashed it again and blow out an entire panel. The rip started from one of the small cuts. I called fixmykite.com and told them what happened. They told me just to send it to them and they will fix it all up. In a short time I had my kite back and ready to fly again. Thank you for fixing my kite. It works great. I used it on my recent trip in the Bahamas. I really found you very competent, professional and helpful. Just wanted to let you guys know how pleased I was with the repair job you performed on my Rev kite that was completed several weeks back. I had tried getting it repaired through many other options that all declined before I stumbled across you guys, and you stepped up and completed the repair quickly, professionally and at a surprisingly low price. I'll gladly pass your names on to other folks. Great job and thank you again. I just wanted to say thank you very much for the repair that you did to my 15m Waroo. I had seriously thought about throwing the kite away. I am so glad I sent it to you. I flew it this weekend and it performs perfectly and I am happy to be reunited with the old girl. The repair is barely visible and I'm sure it's stronger than it was originally. To be honest i don't normally bother to thank people for a service that I've paid for, but i was totally blown away (pun intended) by the repair that you did. Just got it back it looks great! I love the artwork you can barely tell it was repaired, I appreciate the good work!